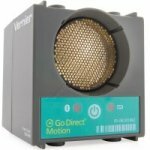 Vernier's Go Direct Motion Detector uses ultrasound to measure the position, velocity and acceleration of moving objects. It directly connects wirelessly via Bluetooth® or wired via USB to your platform. The Go Direct Motion Detector accurately tracks objects as close as 15cm and as far away as 2.5m. Its built-in temperature compensation automatically adjusts for the difference in the speed of sound in cold and warm locations. Its unique design protects the sensor from falling objects during simple harmonic motion or free fall experiments. • Study position, velocity and acceleration of carts when mounted on a track. • Match graphs created in Graphical Analysis 4 software. • Analyze the effects of air resistance on falling coffee filters. • Investigate simple harmonic motion by monitoring a mass on a spring.